Where are you from? Your profession? I’m an Air Force brat born in Tripoli, Libya, but I always thought of Panama City, Florida as my home. I graduated from high school there and went to undergraduate school at Florida State (Go ‘Noles!). While I lived for more than 30 years in Los Angeles, it never felt like home. I’m a proud Floridian and always have been! I enjoyed a career as a systems engineer working in the early years on oil and gas, chemical, and nuclear facilities design and construction projects for the Ralph M. Parsons Company. My profession life closed with a 30-year stint as an Avionics Systems Designer and Architect for Northrop Grumman on various classified programs including the B-2 Bomber and F-35 Joint Strike Fighter. When and how did you become interested in paddling? I relocated with Northrop Grumman in January 2015 from California to Melbourne, Florida, where the opportunities for water sports are endless. I retired in June 2016 and can now avail myself fully of those opportunities. 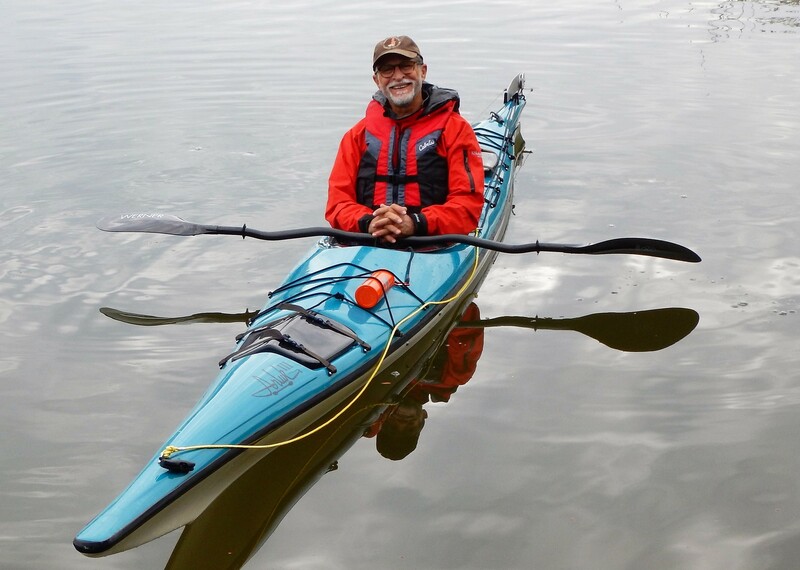 I started paddling as a kayak fisherman, and from there to touring trips was a natural progression. Where is your favorite place to paddle? I’m a newbie to paddling and each place still seems better than the one before it! Every Paddle Florida trip I’ve been on has dazzled me…but Scout Island in the Keys, well that really was breathtaking. What’s the most interesting thing that ever happened to you on a paddling trip? I got dumped by a wave (kayakers call it “swimming,” I believe) on the Keys trip. I went out at the end of the day to try my hand at kayak surfing with some other paddlers and bit off more than I could chew (now I know you’re supposed to lean into the wave). But the water was warm and shallow and I was having an absolute blast, laughing like I haven’t in years. I even managed to catch a few waves after that! You can bet there are some skills training and more kayak surfing in my future (and likely more “swimming” too!). How many Paddle Florida trips have you gone on and to where? I’ve made every trip so far this season and plan to do the rest of them too! – the Suwannee River Wilderness Trail, Ocklawaha Odyssey, and Florida Keys Challenge. Next stop, the Great Calusa Blueway! Can you describe a Paddle Florida trip highlight? On the Suwannee trip, I pushed off early one morning, just behind the leader. It had been a cool night and a thick mist rose from the warm water, almost blindingly golden in the early light. I hung suspended in a cloud, could see only feet beyond the end of my kayak, both river banks invisible. All around dozens of whirlwinds danced on the water, the mist pushed in lines by unseen forces. The sounds I heard through the stillness were a primordial music that spoke to the soul. It was humbling and strengthening and nourishing. The Paddle Florida motto is inspiring meaningful adventure and certainly it was all those things and more that morning. What advice do you have for folks considering a Paddle Florida trip? Join us…we’re having some serious fun! The people you’ll meet are friendly and interesting, the food and entertainment have been good, it even counts as exercise, and the scenery…well I just don’t have words to do it justice.